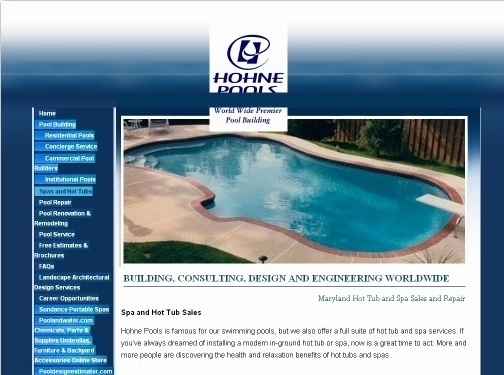 Hohne Pools offers a full suite of distinctive spas and hot tubs. Discover the health and relaxation benefits of hot tubs and spas visit our Baltimore showroom to browse floor models, apply for hot tub financing and find out about installation. Contact us today to find your new spa or hot tub! US (Baltimore, MD) based company providing outdoor pool products and services, including hot tubs for sale. Website outlines details of products and services provided, FAQs, honours and awards, licenses and associations, full company contact details.